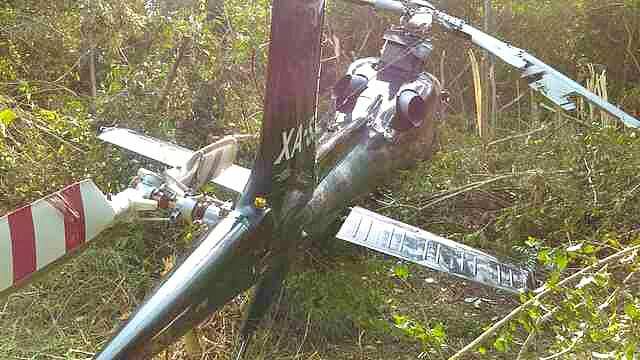 A Robinson R44 Raven II went crashed at about 10am East African Time while on approach into Dar es Salaam’s Julius Nyerere International Airport. All four persons on board the helicopter were killed. 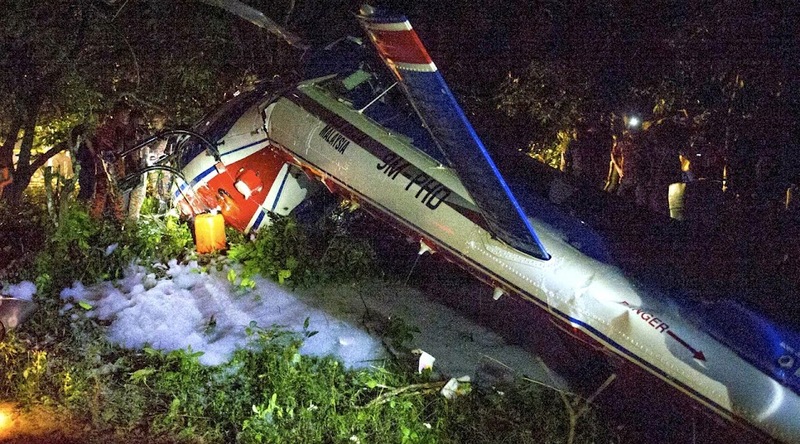 Information from Dar indicates that the occupants were pilots of the police airwing while the pilot in command was attached to either the Ministry of Natural Resources and Tourism or to TANAPA’s airwing. The Robinson helicopter, 5H-TWA, was donated by the Warren Buffet Foundation to the Ministry of Natural Resources and Tourism. Buffet had donated the helicopter to fly patrols over the Selous Game Reserve as part of improved anti-poaching efforts to provide aerial surveillance capabilities. Reportedly on a test flight, the helicopter was following a larger jet aircraft on its approach to the airport leading to speculation that wake turbulence could have may have been a factor in the crash. The Tanzanian authorities have already launched an air accident investigation and it is expected that preliminary findings will be available within weeks, though the final report may take longer to conclude. An EC135 helicopter belonging to the Carabineros de Chile (Chile Police) erupted into a spinning ball of flames after its blades were struck by a fire truck in the centre of San Miguel, Chile. The helicopter was attending a car crash early on Sunday morning when it landed at an intersection in the city's downtown area. Police closed off the street to allow the helicopter to land and assist at a crash caused by a drunk driver which left three police officers seriously injured. When a fire truck made its way into the secure zone it edged too close to the helicopter and made contact with the helicopter's main rotor. All four of the helicopter's blades disintegrated and the tail section broke off sending the EC-135 into a wild ground spin. The helicopter twisted on its skids sending sparks off in all directions. The out-of-control helicopter then collided with a police car, knocking the cab to the ground where it exploded. The pilot was left in serious condition with multiple fractures while the other three officers were being treated in hospital, according to Soy Chile. 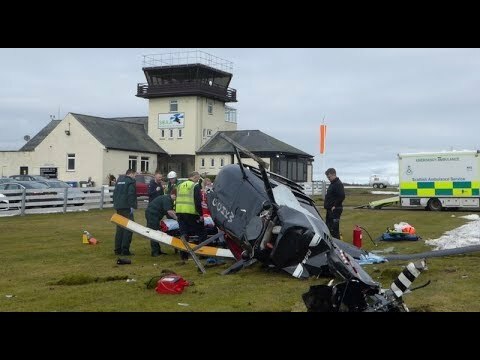 Strange why the pilot did not cut off his engine to avoid the spinning. Yes, indeed. Perhaps he was caught by surprise and then ubable to reach the throttles once the craft began rotating? 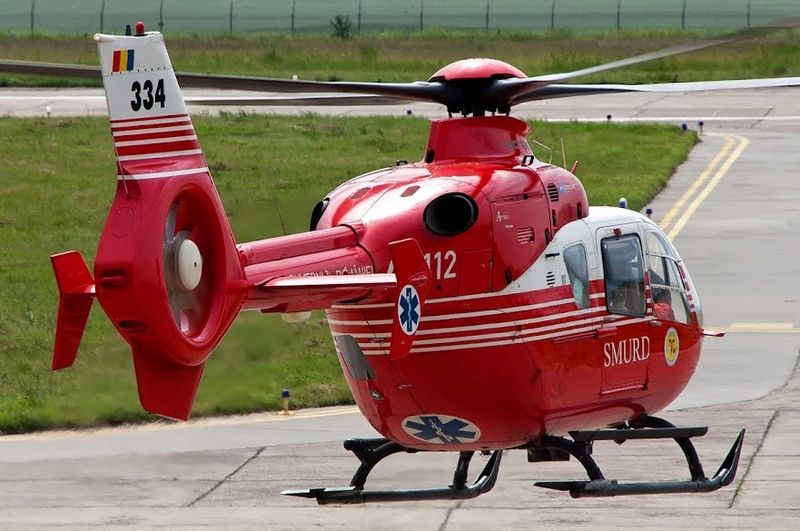 A 25-year-old pilot was able to walk away with minor injuries after her helicopter, an Enstrom 280FX, crashed near a medical center in Weld County, Colorado, Monday morning. The helicopter (registered to New Course Aviation of Jefferson, Colorado) originally took off in Erie and flew to Greeley. It was then close to Platte Valley Medical Center when the pilot experienced engine trouble at around 600 feet - and lost RPM. When it crashed, the tail separated from the fuselage. The pilot suffered minor injuries to her wrist. Two people have died and five others have been injured after a helicopter carrying workers from a Bashneft oilfield crashed in the Russian Arctic, regional authorities have confirmed. 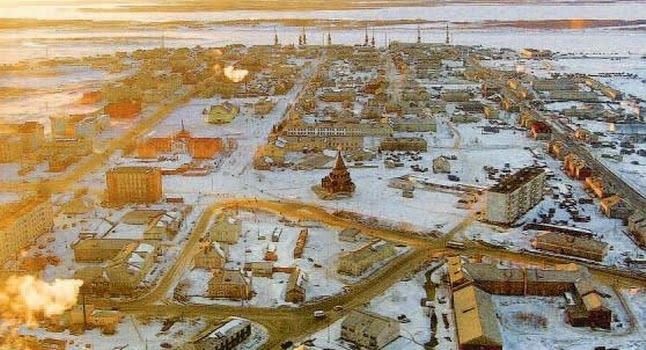 The Nenets Automous Okrug (NAO) said that the Mi8 craft came down two kilometres after takeoff from the Trebs and Titov oilfields on 7 December. The NAO said that one of the crew and one of the passengers lost their lives in the crash, while the other four passengers and one crew member were being treated for their injuries. Authorities say a helicopter carrying four people has crashed into an icy lake in southeast Romania. One person was rescued and a search is underway for the other three. The chopper plunged into the Siutghiol Lake near the Black Sea on Monday afternoon, carrying a pilot, a co-pilot, a doctor and a nurse. Interior Ministry official Raed Arafat said the doctor was rescued and transported to a hospital in serious condition. Divers and rescue workers were looking for the other three at the crash site, 250 kilometers (155 miles) east of Bucharest. The search was hampered by frigid temperatures and darkness. Arafat said the cause of the accident was not immediately known. A Cochise County Sheriff's Office Bell 206L LongRanger has crashed near Benson in Southern Arizona killing both persons on board. Jeff Steele, a 25-year veteran of the Glendale Police Department and an employee of Airwest Helicopters LLC, was identified as the pilot killed in the crash. The 48-year-old man had retired from Glendale police in 2011 after a distinguished career. The second victim was identified as Marc Hansen, 59, a certified mechanic with numerous years of experience. Hansen also was a helicopter and airplane pilot who served in the U.S. Navy. The Cochise County Sheriff's Office was contacted by the helicopter leasing company shortly before 7 p.m. Wednesday and told they had lost communications with Cochise Air near the Benson area. Officials activated tracking software in an attempt to locate the aircraft, according to the Sheriff's Office. Rescue personnel traced a cellphone to an area south of Interstate 10 outside of Benson. At approximately 9:20 p.m., the Benson Fire Department located the crash site and reported to the two deaths. The National Transportation and Safety Board was notified about this incident and are conducting an investigation with the assistance of the Sheriff's Office. Cochise County Sheriff Mark Dannels said words can't describe the tragedy. "This news leaves me personally, and this organization, with a heavy heart because of the tragic loss of two incredible lives," Dannels said. "We have worked closely with this company and these two individuals since receiving Cochise Air, and knowing that they are considered part of the Sheriff's Office family makes this so much harder. We send our condolences out to the families of two people who will truly be missed." 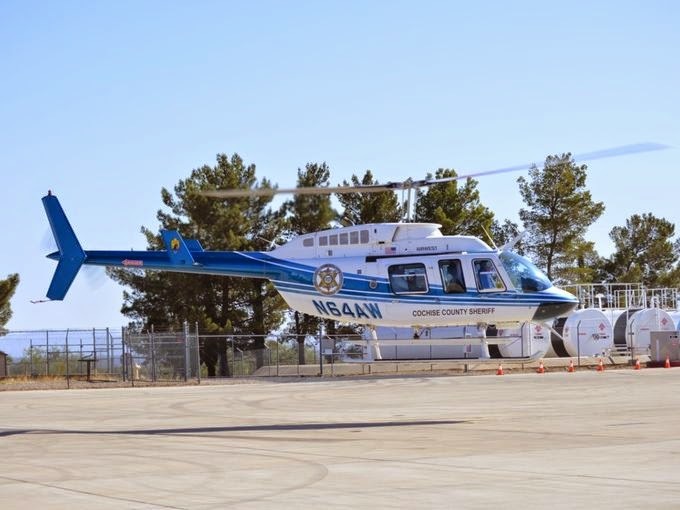 The Cochise County Sheriff's Office unveiled the helicopter last May as part of a one-year exploratory program to boost law-enforcement coverage across the southern Arizona county. The Bell helicopter was capable of carrying six passengers and a pilot and was fast enough to cover the county in 30 minutes, according to the May press release. An Airwest helicopter used by the Cochise County Sheriff's Office also made a hard landing outside of Tombstone on Sept. 12 after it apparently lost its rear rotor, according to a Facebook post from the Sheriff's Office. The pilot, Larry Pucci, and the Law Enforcement Observer (LEO), Officer Justin Dannels, were able to walk away without injuries. "The actions of the pilot in this incident are above commendable as the airship was landed in a clearing in the middle of significant brush and the immediate damage observed was a missing rear rotor,'' the statement said. 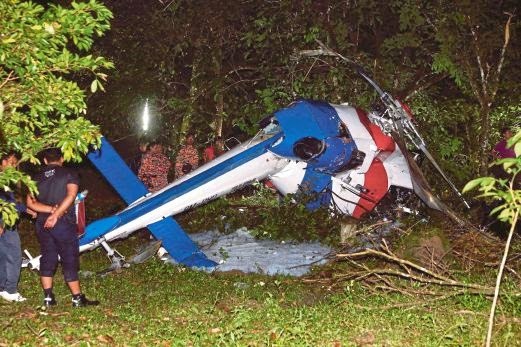 A Royal Malaysian Police AS355 TwinEcureuil has crashed in Malaysia seriously injuring all four persons on board. Those injured in the incident are the pilot, Inspector Amirul Adli Ahmed, co-pilot Assistant Superintendent Hasni Hassan, crew member Sergeant-Major Mohd Hook Abd Majid and Lance-Corporal Arhafidah Zakaria. The helicopter was being used in flood support operations which it crashed without explanation. 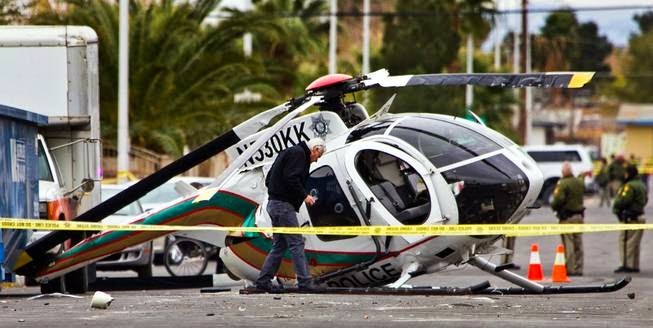 A Las Vegas Metro Police MD530 helicopter has crashed near downtown Las Vegas injuring both crew members. 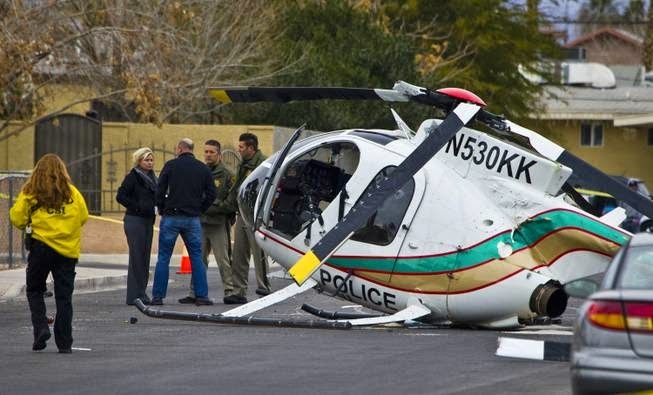 The helicopter was responding to a call involving a stabbing suspect, when it crashed on 23rd Street near Bonanza Road. Two Ecureuil helicopters (an AS350B3 LQ-CGK and and an AS350B2 LQ-FJQ) carrying passengers filming a popular European reality show, crashed Monday in a remote area of northwest Argentina, killing eight French citizens and two Argentines, authorities have said. 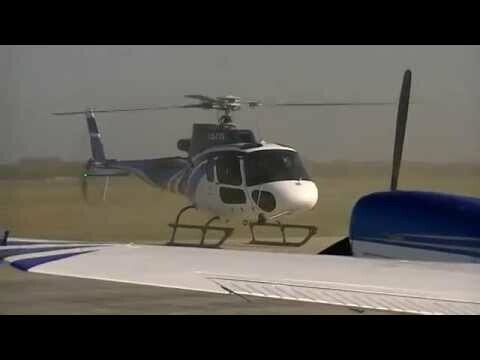 The helicopters crashed while flying near Villa Castelli in La Rioja province, about 730 miles (1,170 kilometers) northwest of Buenos Aires, La Rioja Secretary of Security Cesar Angulo told television station TN. All 10 people on board both aircraft were killed. 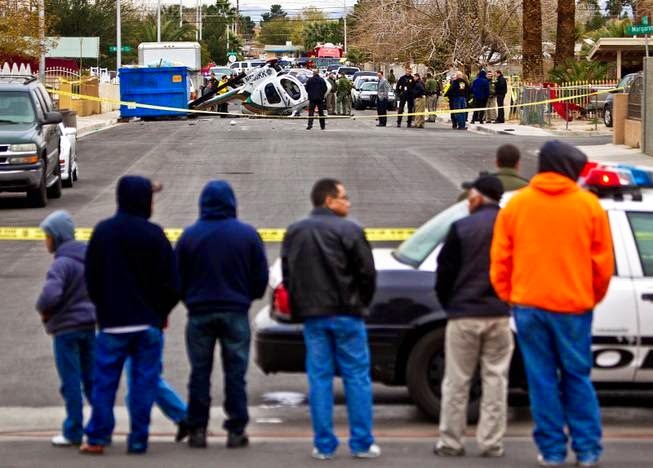 "An explosion occurred and it's believed that they collided," said Angulo. Photographs showed the burning and smoking wreckage of the helicopters on the ground in dry scrubland with people gathered nearby. A statement from La Rioja's government said that among the 10 dead were French sports stars, including Olympic gold medal swimmer Camille Muffat, Olympic boxer Alexis Vastine and champion sailor Florence Arthaud. The French sports figures were part of a team filming the reality show "Dropped," a survivalist program with several versions across Europe, said the mayor of Villa Castelli, Andres Navarrete. The crew had arrived on Sunday in Villa Castelli, where it had previously filmed a version of the show for Switzerland and Denmark, said Navarrette. "The causes of the crash are not known," Navarrete told radio station Cadena 3. Angulo said one of the helicopters belonged to La Rioja province and the other belonged to the neighboring province of Santiago del Estero. "The helicopter from La Rioja was a Eurocopter with a capacity to hold six people. It appears to have brushed against the other helicopter from Santiago del Estero shortly after takeoff," the statement from the provincial government said. Muffat, 25, won gold in the 400-meter freestyle, silver in the 200-meter freestyle and a bronze in the 4×200-meter freestyle relay in the 2012 Summer Olympics in London. Vastine, 28, won a bronze medal at the 2008 games in Beijing in the 60-64 kilogram category. A rugged, sparsely populated area is on the edge of the Andes mountain range that separates Argentina and Chile. 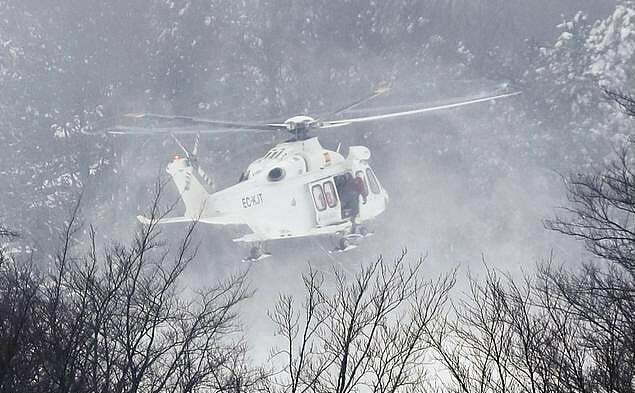 An AW139 (EC-KJT) operated by Inaer Italia on behalf of AREU 118 Regione Lombardia has crashed in fog during a rescue mission near a ski resort in Campo Felice, Abruzzo, with the loss of six lives. 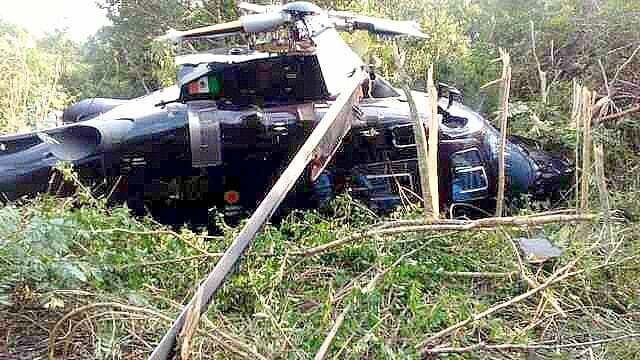 Six people have miraculously survived a crash involving an AW109E in Mexico. The aircraft, XA-SJC, crashed in a wooded area at approximately 3pm local time about a mile from El Tajín Airport where it had departed en route for Mexico City. The pilot, a flight mechanic and four passengers all reportedly survived the crash without serious injury. 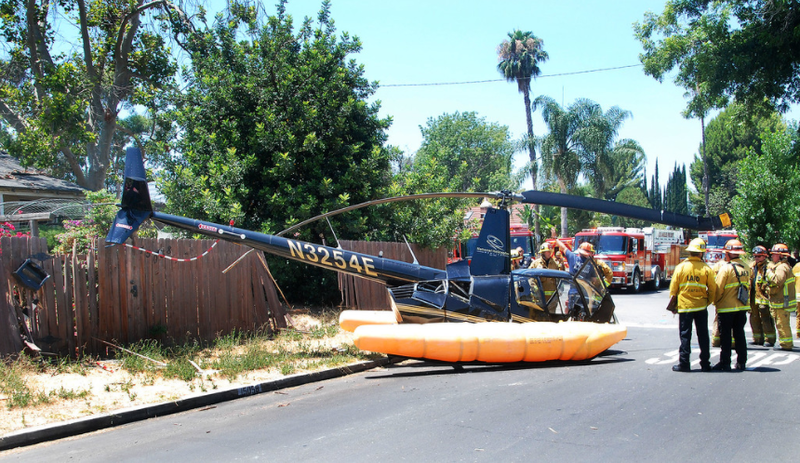 A Robinson R44 crash-landed on a residential street in Sherman Oaks, California on Friday without hitting any homes or people on the ground. On board were three adults and a 16-year-old girl, all of whom walked away with only minor injuries, authorities said. The Robinson R44 is owned by a Van-Nuys based National Helicopter Service who offer aerial tours and charter services. 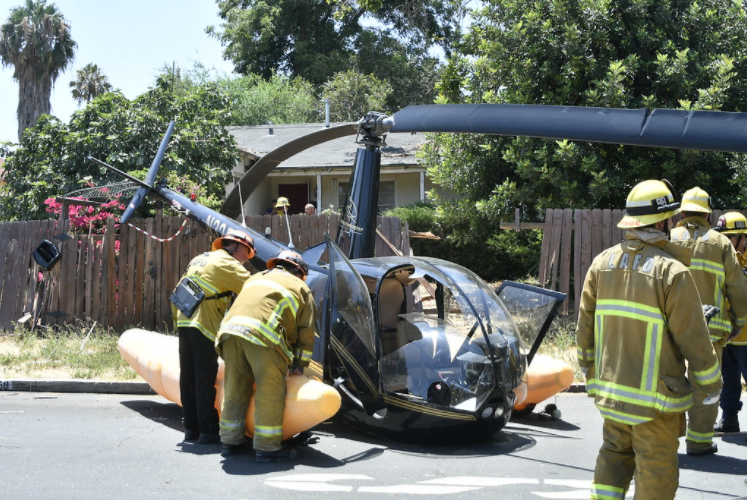 Los Angeles Fire Department Battalion Chief Daniel Curry said that the helicopter made a “hard landing” just after noon on Valleyheart Drive in Sherman Oaks. 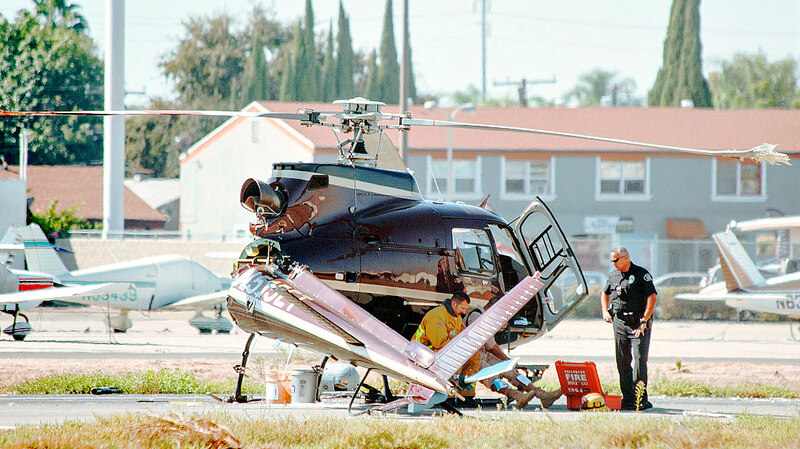 An AS350B2 operated by Chapparal Air Group encountered what was described as a 'hard landing' last Wednesday 27th September at Fullerton Airport in Orange County, California. The aircraft was evidently engaged in an annual training exercise when an undetermined event led to the helicopter making a hard landing in which the craft's tailboom was severed. Two persons were on board at the time of the accident neither of whom were seriously injured. G-CHKW Robinson R44 was rolled over at Perth Aerodrome two days ago.... not by the owner or a pilot but by an engineer during a ground run. From pictures I have seen it is very badly damaged (a write off) but luckily the engineer escaped through a broken window. It looks like it was then lifted back onto its skids before being sprayed with foam. Suspect fuel started leaking. From other reports AAIB do not investigate as it was not an accident - intention to fly. Of the companies I flew for, none of them permitted ground running by mechanics. While on the matter of damage to aircraft by non-owners or pilots, did you hear about the Russian aviation technician who after being fired performed (without charge) some final modifications to one of the aircraft he had worked on? Wow that's what I call getting even ! An update states that there was only 1 POB and it seem it was a fatal accident. Being local to Cumbernauld and knowing staff at that base my thoughts go to all employees and families on this sad day. It is believed the five occupants have all perished. The Leicester City owner, one of his daughters a friend and two crew. An update quotes the five occupants were The owner, his two assistants and the two crew all of whom have been named in the press. I also note one newspaper, if you can call the Sun a newspaper, has quoted someone from an aviation forum as saying, at any arena with floodlights moths are attracted to the lights and in turn bird to the moths and thought a bird strike to the tail rotor was a possibility. Ah the armchair AAIB again. It just shows that what we say on any forum could be used by the press and obviously is ! All times are GMT0. This page was generated at 09:49.